These disposable non-woven BZK antiseptic towelettes are ideal for quick sanitization of tools and implements or for preparing skin before waxing. The perfect item when soap and water are not available. Air dries in seconds. CAUTION: Keep out of reach of children. If swallowed, get medical help or contact a Poison Control Center right away. Do not use in eyes or apply over large areas of the body. These disposable 2-ply non-woven prep pads saturated with 70% isopropyl alcohol are ideal for quick sanitization of tools and implements or as an antiseptic for skin before injections or treatments. Each pad is individually wrapped for your convenience. Sterile unless pouch is opened or damaged. Warning: For external use only. Flammable, keep away from fire or flame. Do not use with electrocautery procedures. Keep out of reach of children. If swallowed, get medical help or contact a Poison Control Center right away. If contact occurs, flush eyes with water. 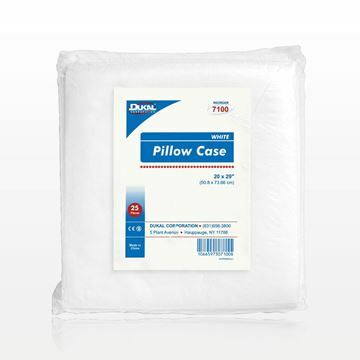 Maintain a hygienic environment during skincare and massage treatments with this standard 20 inch x 29 inch non-woven polypropylene disposable pillow case by DUKAL™. 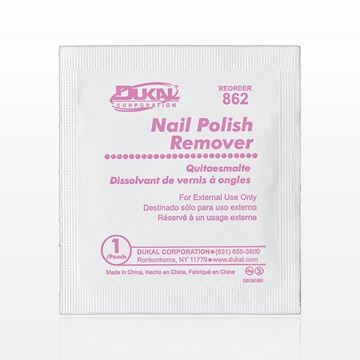 These nail polish remover pads quickly and gently remove nail polish from artificial and natural nails. Each pad is individually wrapped for your convenience. Warnings: For external use only. Avoid contact with eyes. Flammable; keep away from heat, fire and flame. Keep out of reach of children. These disposable non-woven towelettes are ideal for quickly cleansing the face, hands and body without the use of soap and water prior to treatments or injections. Each pad is individually wrapped for your convenience. Sterile unless pouch is opened or damaged. Warning: For external use only. Flammable, keep away from fire or flame. Do not use with electrocautery procedures. Keep out of reach of children. If swallowed, get medical help or contact a Poison Control Center right away. If contact occurs, flush eyes with water.